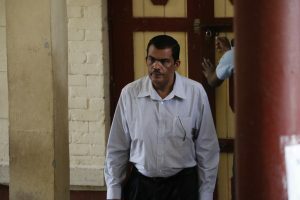 Disagreement surfaced Monday afternoon over whether the High Court decided that a fraud case against former Deputy General Manager of the Guyana Rice Development Board, Madanlall Ramraj has been stayed, with Guyana’s Solicitor General, Kim Kyte saying that the State complied with Justice Navindra Singh’s order to produce a report. “No stay was granted. We complied with the Order. The Magistrate’s order is that a redacted report or an edited report, if you want to call it that, be served on the defendant. We have complied with that order because you see it’s a question of relevance,” Kyte told reporters. 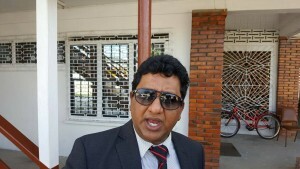 The majority of the 160-page “Guyana Rice Development Board Forensic Audit Report for the period November 1, 2011 to May 31, 2015” forensic has been obscured because, according to the Solicitor General, only the parts that are relevant to Ramraj have been released. She explained that the other parts of the Forensic Audit Report either have nothing to do with Ramraj or are related to other persons who might be charged. “You would be giving out other people’s information to him and it’s not relevant to him. No court would order something like that. It’s perhaps relevant to other people who are not even before the Court as yet. 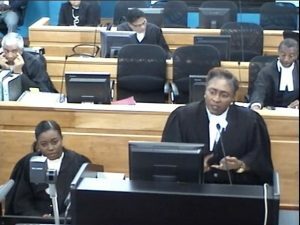 The Solicitor General stressed that the former GRD Deputy General Manager “has to go to court until some other court says differently”. Kyte recalled that Justice Singh’s order was that the Report be served on the Defence Lawyers or the case would be stayed permanently. A State Counsel was reportedly told by Justice Singh that if the Magistrate ordered the submission of a redacted report, that is what is served. 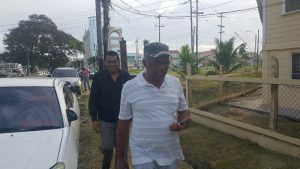 FLASH BACK: Former General Manager of the Guyana Rice Development Board, Jagnarine Singh (wearing cap) and former GRDB Director, Madanlall Ramraj make their way to SOCU. indicated that if any further directions are required of him in relation to this matter, he is prepared to give them, provided that the requisite application is made,” Nandlall also said in a statement. approach the court for an order for directions,” Kyte said.